Have the coolest, most comfortable flights in your TBM 700 for both pilots and passengers! Finally – heat and glare solved for the TBM 700 cockpit and cabin! Now you can enjoy cool, comfortable flights with our heat, glare and UV-blocking Jet Shades Solution installed in your TBM 700 aircraft. With our Jet Shades Solution, both pilots and passengers will experience improved in-flight comfort and reduced fatigue. You can also keep your Jet Shades installed on the ground. That means no more wrestling with foil guards when you park*. And while the TBM 700 is already an attractive plane on the ramp, with Jet Shades installed, it will look even more amazing! Scroll down to compare solution packages, specs & more. *Always follow the aircraft manufacturer’s and Jet Shades’ instructions when leaving Jet Shades installed while parked. Our superior package for TBM 700! The evolution of the 700 series has witnessed an enhanced interior for improved comfort. But heat and direct sun can still be a problem in the aircraft, making flights less enjoyable for passengers — as well as pilots. make your TBM 700 a sharp-looking plane on the ramp! With this package installed in your TBM 700, you, your family and other passengers will want to fly in your aircraft just because it’s so nice inside! While Jet Shades are designed to provide the best visibility out of the side windows for pilots, the upper half of the windshield and all cabin windows can be upgraded to our Premium Jet Shades specially formulated with a deeper cool blue color that further reduces the amount of heat, light, and brightness that enters the aircraft. The tint also creates a more enjoyable cabin environment by allowing passengers to keep the window shades up and enjoy the view. A Premium upgrade for the upper windshields also gives pilots superior glare reduction that decreases eyestrain, fatigue, and headaches. And, with a mirrored look, the Premium package looks great on the ramp as well! If you want the coolest and most comfortable flights for passengers and pilots, the Premium upgrade is the way to fly. The Total TBM 700 Solution Jet Shades insert easily into the side cockpit windows, upper windshield, and rear cabin windows. Because of their design, there’s no STC required. Once installed, you’ll notice a significant reduction in the amount of heat and solar energy entering the plane. The package will also provide the maximum protection for your TBM interior from solar damage. In these cases, we can work with your local repair shop to have them custom fit Jet Shades to your plane. Contact us for details. Looks Great Inside and Out! The Total TBM 700 Solution Jet Shades not only look like they’re part of the original aircraft from the inside, but the ramp presence from the outside will turn heads! Check out our Premium package upgrade and product specs. Start enjoying cool, comfortable flights with one of our Jet Shades Solutions installed in your TBM 700 aircraft. The TBM 700 Cockpit Solution includes two high-visibility side window and two high-visibility windshield Jet Shades that easily insert. Once installed, they block heat, glare, UV, and solar energy from the pilot and copilot. The TBM 700 Cockpit Solution provides maximum protection while allowing maximum visibility for spotting traffic, viewing landmarks, and enjoying great sights while flying. As a pilot, you’ll feel more comfortable, avoid ‘sun glare headaches’ after long flights, and feel more refreshed when you arrive. While Jet Shades are designed to provide the best visibility out of the side windows for pilots, the upper half of the windshield and all cabin windows can be upgraded to our Premium Jet Shades specially formulated with a deeper cool blue look that further reduces the amount of visible light and brightness that enters the cockpit from above. The result is superior glare reduction that decreases eyestrain, fatigue, and headaches for pilots. As pilots ourselves, we highly recommend this option. 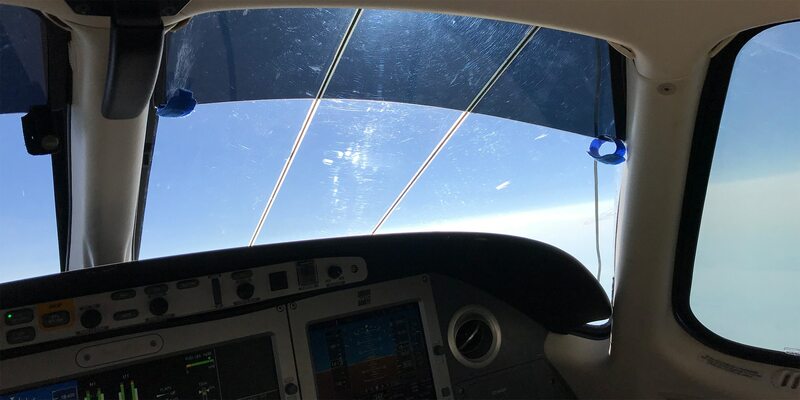 While all TBM 700 Solutions are designed to provide the most protection from solar energy and optimal visibility, our Premium package upgrade offers maximum cooling and glare protection in windows or areas of windows that pilots don’t have to look through while flying, including passenger windows. NOTE: Premium Jet Shades cannot be used in the side cockpit windows. Check out our product specs. Start enjoying cool, comfortable flights with one of our Jet Shades Solutions installed in your Piper aircraft. Reduces glare by 70% (>80% Premium Upgrade) for better contrast and visibility on instrument panels, smartphones and tablet devices. Check out our premium package upgrade.